The name "peafowl" refers to what is commonly known by man as the peacock. In actuality though, the male peafowl is the known as the peacock, the female is known as the peahen, and the chicks are called peachicks. 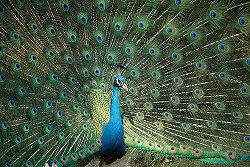 The peacock has been known throughout history for its beautiful display of feathers. The peacock was recorded in the Bible as being one of Solomon's favorite pheasants that he owned . 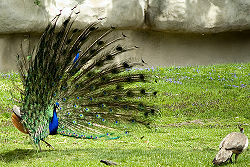 The Indian Peacock is also regarded as very sacred in India and is worshipped by the Hindus. Hindus believe that the spots on the birds' trains represent the eyes of the gods. The Indian Peacock is also the country of India's national bird so it is protected by the government . Peafowl are one of the larger birds. They range in weight from 2.6 to thirteen pounds with a body size of two to four feet with females being smaller body. As is typical of birds, most Peafowl are sexually dimorphic (have systematic differences in form between the sexes). The males have a long train of feathers that can grow up to five feet! The males' feathers are brightly colored with bright greens and blues in order to attract their mates. The females are brown and speckled in order to blend in with their surroundings. The Indian Peafowl is the most common Peafowl and displays the aforementioned dimorphism. However, both the male and female Green Peafowl have a green chest and the rest of their bodies are covered in brown and green feathers. Specialized breeding can produce peafowls with a variety of colors such as: black, pale, and white. A peafowls' face can look odd because the areas around their eyes are free from feathers. .
A male presenting himself to a female during mating season. 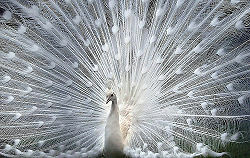 Peafowls reach a suitable breeding age when they are two years old and when the male has a full train. Breeding season starts in April and ends when the male molts his train at the end of summer . The male attracts the female by displaying his beautiful plumage and emitting a high pitch screech. A peahen chooses her mate with the mindset of "the bigger the better". Females usually prefer males with longer trains and a beautiful, ostentatious display of plumage . A male's train is very long in length by the age of two or three, but reaches full growth at the age of five or six. One male can mate with up to five different females in one season . Peacock reproduction is very similar to that of any other member of the pheasant family. The male and female both have openings called cloacas where waste and reproductive cells leave the body. The male mounts onto the female's back and presses his cloaca onto hers. At this moment sperm leaves the male and travels through the female until it reaches an ovum which turns into an egg . A female lays her eggs about four to ten at a time, depending on conditions and about two days apart each. Before laying the eggs the mother peahen makes a light nest on the ground with sticks . The mother will sit on her eggs and protect them for the next month before the little chicks to poke their heads out of their shells . After that the mother is on her own to take care of her chicks until they reach a mature breeding age. Peahens makes very good, attentive mothers. Peafowl are indigenous to Southeast Asia, India, Pakistan, and Sri Lanka, but they have been introduced worldwide. They inhabit deciduous forests, open fields, and farmland . In captivity they can be seen in golf courses, parks, and yards. . Peafowl enjoy warm climates and the Green Peacock is especially sensitive to the cold. In mating season they travel in groups of females and males numbering between three and five. After mating season the peacocks and peahens separate from each other . Peafowl eat seeds, nuts, and fruit, but they also can eat small animals like mice and other rodents. In the wild they are prey to large mammals such as wolves, cougars, lions, and other large cats. In defense the peacock uses its large train to try and scare off its predators. Their goal is to seem larger than they actually are. A peacock also can emit a high pitch scream to warn others of an approaching predator . In captivity their biggest threat is man, in which they have almost no defense. It is not uncommon to see a captive peacock in both America and around the world. Breeders have developed many different looks and styles of peacocks that all came from Pavo Cristatus and Pavo Muticus. It is much more common to see the India Blue Peacock because it is easier to take care of then the Green Peacock, because the Green Peacock is more susceptible to the cold. A Green Peacock will be more expensive than the common peacock because it is bred less often . Extra attention should be paid to both types of chicks, because it takes a while until the chicks are fully grown . For the first two to three months chicks should be kept in an incubator because of their need for heat. After that the chicks should be kept in some sort of flight pen until they reach breeding age. While deciding the pen's size you need to realize that a male's train can reach long lengths . The peafowl eat the same as any other bird and you can feed them grain, seeds, nuts, and "crumbles" of different foods. Peacocks stay very close to home and aren't prone to wandering, but it is still advised to keep them in a covered and secured pen. They adapt very well to a pen and can live and breed in captivity just fine . Birding: Peacock Reproduction by Roger Lederer. About.com. The Peacock Pages: All About Peacock Keeping! by Lisa Johnson. The Game Bird Gazette. Peacock by Fort Wayne Children's Zoo. Fort Wayne Zoological Society. PEAFOWL Family Phasianidae by Craig Hopkins. UPA. Birds: Peafowl by Zoological Society of San Diego. Peacock by Bird Breeds, an encyclopedia of the world's pet birds. This page was last modified on 23 July 2014, at 20:57.